Posted June 8th, 2011 by Karl & filed under MailBigFile News. As some of you may have seen we have launched a great new mobile web application for all of our users. This allows you to track your files on-the-go on your mobile. Once logged in to your account you are able to follow all of your uploaded and received files quickly and easily, seeing if they are still active, how many times they have been downloaded and who by. 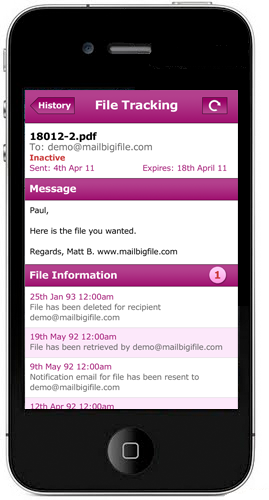 All you need to do to use this on your phone is go to www.mailbigfile.com/mobile and bookmark it to your home screen. You can then just click on our logo to access the application directly from your home screen without having to use your browser. A native app to be added to the app store is currently under development and we will keep you updated.